If you are like me, you probably don’t have cable in your house. However, a simple HDTV antenna is more than enough to get decent channels. Unlike Netflix or other services, sometimes you want to watch something live. These antennas allow you to receive uncompressed HD quality programs without having to pay any monthly fees. When selecting an antenna, you need to consider the range. Range has a direct impact on the number of channels you will be able to watch on your TV. Most of the antennas with similar prices as this one have a range of about 25-miles. 1byone has upgraded their line of indoor antennas and recently released for 2019 their model which has a range of up to 50 miles. This is possible thanks to the built-in amplifier/booster. It enhances the signals that usually get blocked on the way to your TV. If there are not many obstructions along the way, it can deliver a range of up to 80 miles. Its CleanPeak Filter technology gets rid of signals that mess up the picture, like FM or cellular waves, delivering a much brighter and clearer picture. The designers took their time creating an antenna that not only works well, but also looks great. 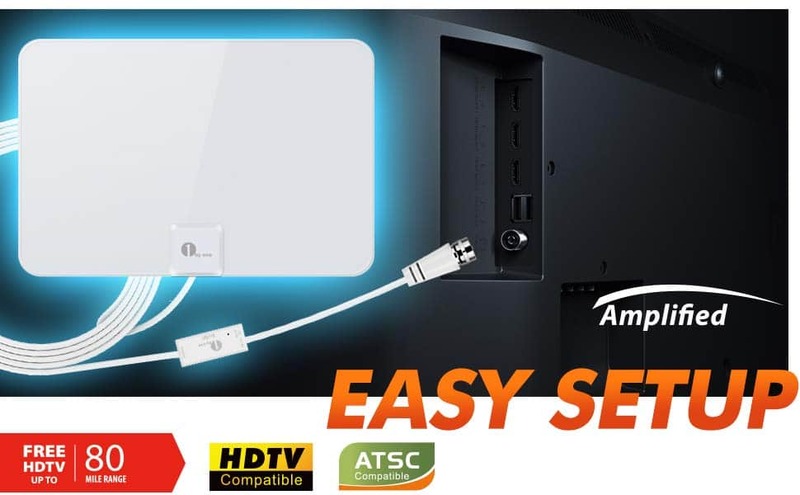 It is paper-thin and all you need to do is plug it in via the coaxial cable and turn on your TV. You can keep it hidden behind the TV, lay it on the table, or stick it on the window or wall. The coaxial cable is 20 feet long, more than enough to place the antenna wherever you need it. Of course, you need to remember that with these antennas you’ll only be able to receive channels that are available in the area where you live. You can take a look at websites like TVFOOL, where you can enter your address, and it will analyze your location to determine which broadcast television signals are available in your area. 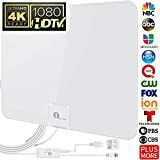 So, if you don’t watch much TV, or are only interested in the major channels like ABC, CBS or Fox, this 1byone Upgraded 2019 Digital Amplified Indoor HD TV Antenna will be a perfect option to keep up with your shows.